This model IM-609A is one of our popular selling prodcuts which is a PolyCotton Inkjet printing art canvas. Fine textured Matte surface. 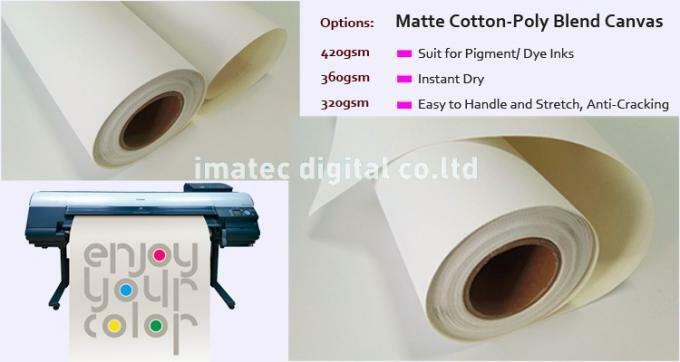 Gram weight of this model is 360gsm.It has an excellent ink control and absorption,when stretching canvas,there is no cracking or tearing.This canvas is suitable for pigment and dye inks. It's widely used in high-resolution graphic output, wall stretched canvas decoration, indoor images and so on. Usual size is 24", 36", 42", 44", 50", 60"*30m/roll. OEM service is also welcome. 6) Color restoration is more realistic and clearer.